If you have one who is a Disney PLANES fan, this is a really cute toy for the holiday season! 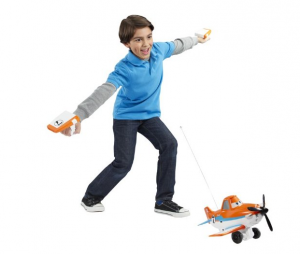 Disney PLANES Dusty Crophopper is $39.97 on Amazon and it’s remote-controlled with wings that attach to the kids. They control the movement my mimicking flying around themselves – so cute, right? There are some pre-programmed moves that work at the touch of a button and the kids will love to drive and steer Dusty with their arms. This toy is listed as good for kids ages 3+. Get Disney PLANES Dusty Crophopper for $39.97 on Amazon. « Hinge Leather Jackets on Sale on Nordstrom!